Timeless: Design meant to last. The ADOR storage boxes are not for a trend, they are made to last the test of time. The timeless design will mean that these boxes will never look like a thing of the past so moving these boxes into a new home will not be a tough nut to crack. The clean lines and shape of the box are neutralized with clear matt finishing to blend into home environments without causing a blare in the storage section. Coloured boxes(pink,purple,yellow etc) discolours over time or fall out of trend. Our designers have specifically used the clear colours for future usage in the belief of timeless designs. Item is self-assembled in under 5 seconds with easy to fit in parts, do not require any special tools just fit and use. The ADOR Drop Front Shoe Box is a must-have for every sneakerhead to stack their collection to prevent shoe discolouration, moulding due to high humidity in Singapore or just simply protecting the shoes from collecting dust. 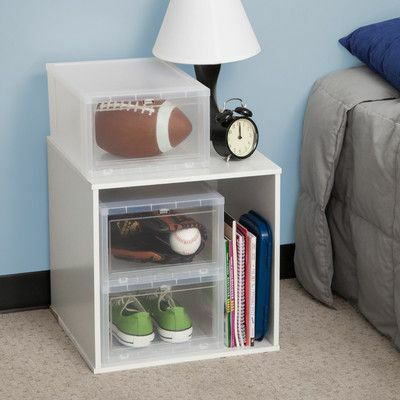 Popularly used by the #hypebeast, #sneakerhead or the “OCD” in organized storage. The drop front shoe box is a way to show your collection to the world, or your friends. The ability to stack well above 12 boxes helps you to create columns of different collections from the Yeezy, NMD, Air Jordans and other sneakers for easy identification. The strong structural integration for stacking guarantees that your boxes will stay well in place without wobbling. Every box is finished with superior perfection to details, no edges left unchecked. 7,600 boxes sold in Singapore from August 2017 to May 2018! ADOR drop front boxes are well adaptive for other usage in home such as dried goods storage in the kitchen or medicine cabinet. Office accessories, papers, things that you want to keep from flying away or misplacing? The use of ADOR boxes are limitless and we are not even finishing with the list of things you can use these boxes with! Item is not applicable for discount codes. Best quality box I have ever bought ever. Indeed premium quality for its price point, highly recommend!